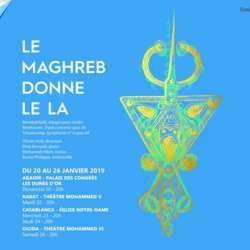 To start the year under the best auspices, the Maghreb Philharmonic Orchestra is reorganizing itself for a series of colorful concerts to celebrate sharing and fraternity. This program brings together two huge composers of classical music: Beethoven and Tchaikovsky. Beethoven's triple concerto, contemporary with the writing of the "heroic" Symphony whose influence we perceive, innovates by the instrumental force for which it is written: three soloists (violin, cello and piano) and the Orchestra. It is an exceptional and original structure, halfway between the concerto, the chamber music and the symphony, where the composer has magnificently been able to give his place to each of the instruments, with respect to each other and to each other. others, creating a dialogue between them. Tchaikovsky's fifth and penultimate Symphony was painful for its author. His writing was laborious and the criticism far below his expectations, plunged him into doubt. It expresses its torments, the "total submission to destiny or, what is the same, the inevitable predestination of providence". Only on the occasion of a new tour in Europe, encouraged by the musicians who play it and his friend Brahms, he regains confidence in his creation: "At each rehearsal the symphony pleased the musicians . In general, it was a real enthusiasm [...]. The concert was also very good. But the most pleasant thing is that the symphony has ceased to appear to me lacking and that I have resumed my affection for her. ". Proof of this is that music never ceases to unite, federate and create spaces of exchange, dialogue, expression and self-esteem with respect and acceptance of others; values ​​that the Maghreb Philharmonic Orchestra wishes to promote.